I admit, it's been quite a while since I last had pan de sal. 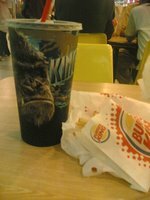 But when my companions bought some (with pancit as palaman) friday last week, I couldn't believe my eyes. They've shrunk! 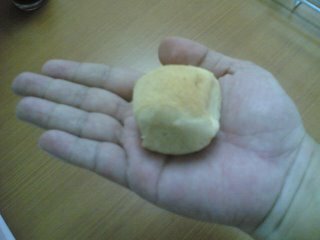 Same price at one peso, but it's way, way smaller! It's been exactly one year last December 14 when my wife woke me up at half past 12 midnight and said I should bring her to the hospital. I was still feeling quite groggy then but was jolted awake when she said there was lots of blood when she urinated. I saw the red liquid on the wiwi bowl and immediately carried my wife down the stairs into Blackie (that's the car). She got confined and was asked to wait for a while in the public ward. A little later, she said her bed was wet. I looked under the blanket and indeed it was! The nurse came right over and asked if she urinated. She said no. Her bag of water broke! She was then sent to the emergency room and her Ob-Gyne arrived right over. I made three more trips to and from the house that morning. I called my boss to ask for a week's leave of absence, which he immediately granted when he learned the situation (he didn't know my wife was pregnant then). He also called me up mid-week to ask how we were. I am so grateful for having an understanding boss. It was indeed a frightening experience. Miraculously, her bag of water closed and held enough liquid for the baby to survive in. I booked a private ward and we stayed there for a week. Ninang Bell visited and brought us the Medicard papers to subsidize the hospital costs. This was the time I truly appreciated health insurance. Other friends visited to see how we were. She was then subjected to bedrest for the rest of the term of her pregnancy, though that didn't stop her from staying in the living room and spend her days waching TV. Must be why our baby loves watching TV too! Jo-Lo is truly a miracle baby. We thank the Lord for him. 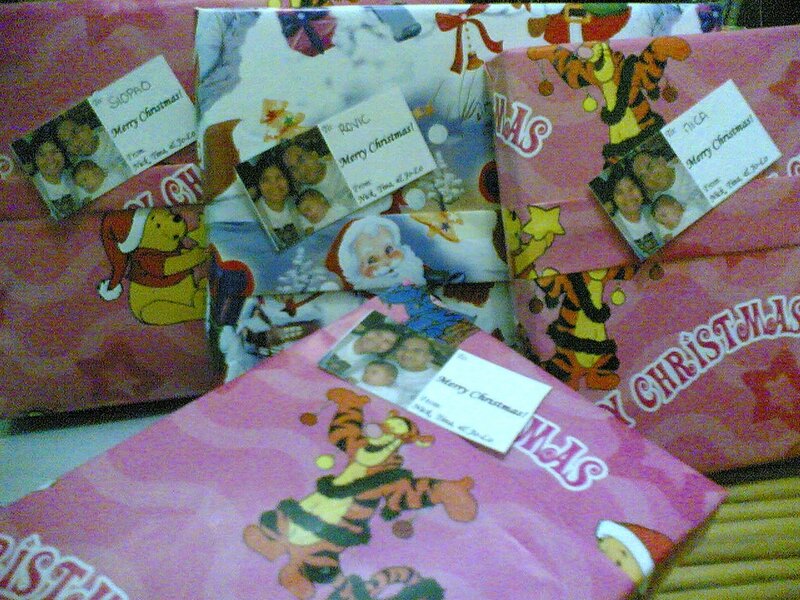 The first batch of gifts have left our home and found new places underneath our friends' christmas trees. Call me a sentimental old fool, but I still prefer wrapping my own gifts, even if it meant staying up late. I don't know, but it feels good wrapping gifts while imagining the look (of delight, hopefully) of the recipient when it is opened. No matter how simple the content is, the gift feels special when you take the time and effort to wrap it yourself. We lived in a small rented house and we shared rooms when I was a kid. But that didn't stop us from buying gifts and stashing it secretly in places where we didn't think the others would look. And then we'd find time away from our siblings to wrap our gifts and stash it underneath the christmas tree. And every now and then, we would visit the tree, pick up a gift, press it close to our ear, then shake it. We'd exclaim, "Ah! A shirt!" or "this is a toy car!," then move on to the next gift. Our eldest sister got so good at guessing what's inside gifts (no matter how much paper you stuff inside so it wouldn't make a sound) that she got it right 90% of the time. I would like to impart some gift wrapping ideas in time for this yuletide season! Print your own gift card! A photo of yourself or with your family in the card will make the recipient feel that the gift is indeed special, no matter what it is. Our personalized gift tag includes a photo of myself, my wife and baby Jo-Lo. 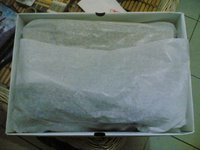 Wrap the gift in paper or cloth before putting it in the box. I use white Japanese paper for this purpose. Aside from putting additional folds onto the wrapping paper, tie a nice ribbon to it. 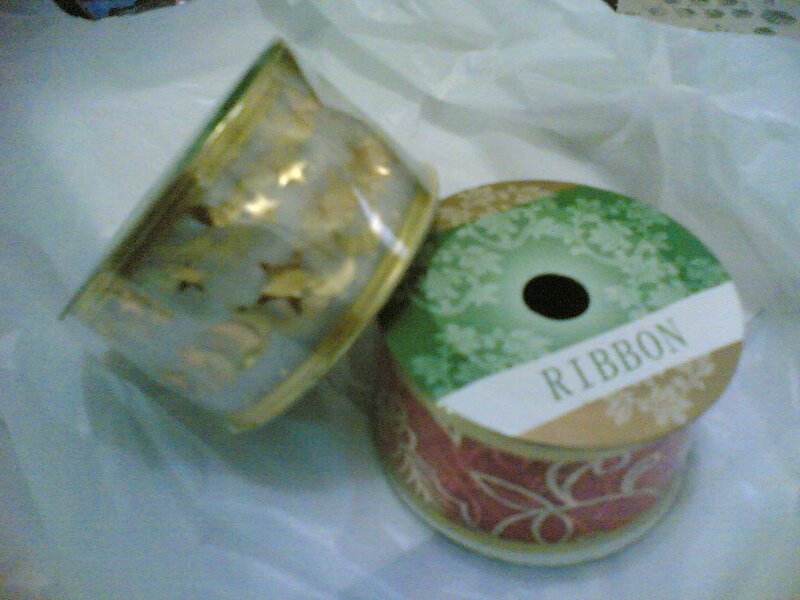 These ribbons are cheap in Divisoria, but are quite expensive in the malls so if you do not have time to go to to Divi, then perhaps you can reserve the ribbon for special gifts. 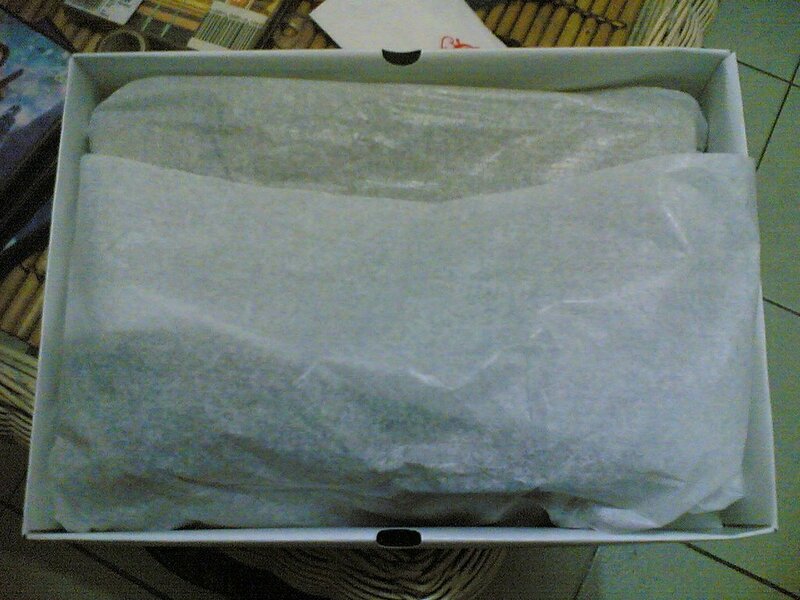 Lastly, when you're really in a rush and have no time to wrap items with no boxes, use Quick Wraps. This is available in National Bookstore and gift shops. 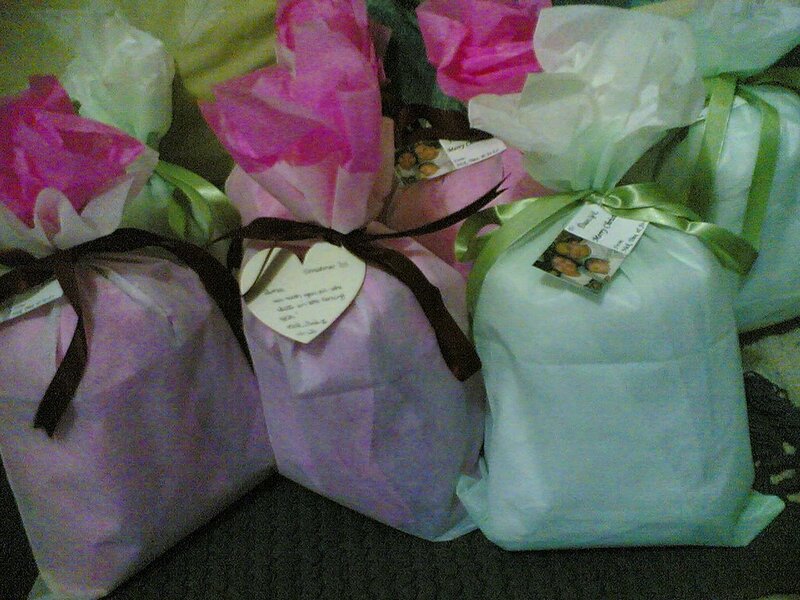 The small one costs P16.50 each and includes the paper to wrap the gift in, the bag, a ribbon, and a tag. These come in nice purple, pink, and green. I was in the basement of Shangri-La Edsa last night taking my Burger King Whopper and King-Kong sized soda when I decided to have a look around. It was a big mall after all! 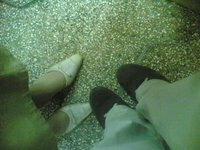 I went to the uppermost floor and found a variety of people milling about. More like celebrities, actually. I'm sure my wife would have gone starstruck again if she saw Janice de Belen, Nancy Castiglione, and a host of other people who are strangers to me. I know, I know. If I were with you and you would excitedly hop about because you saw a calebrity and I can't relate, you would bonk me on the head. At any rate, I saw this rectangular form up ahead covered in white cloth. What's this? 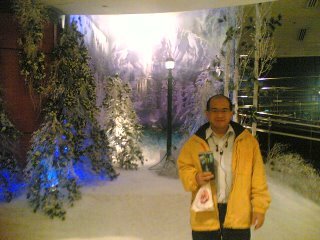 I removed the white drape and saw before me a magnificent, wooden wardrobe with intricate carvings of trees and animals. I've never been inside a wardrobe before so I opened the door and took a peek inside. Just old coats with the smell of mothballs. But wait ... I felt a cold breeze sweep through my face. Air conditioning? Inside a wardrobe? I ventured a step inside. And another. And another. The wardrobe is bigger than it looks from the outside! Further and further I trudged until I felt some twigs and branches and cold snow crunched on my every step. Strange. Soon enough I was at the edge of a clearing. It looked like I was in the woods in wintertime. And strangely enough, there's a lamppost in the middle of it all! After some time, I felt something moving along, walking nonchalantly towards the lamppost. It was the Cherry flavored Ampalaya! She stared at me. I think it takes more than a human to surprise her. "Want your picture taken? 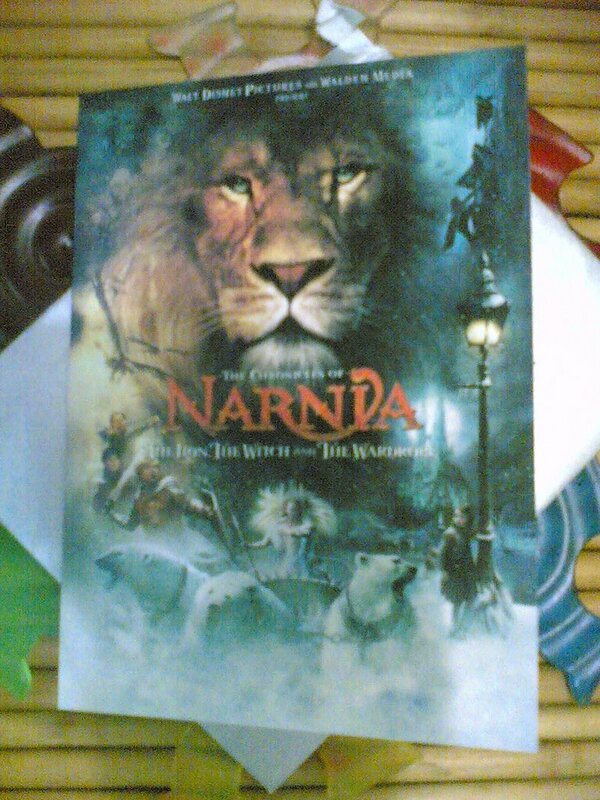 This is your first time here in Narnia after all, Son of Adam," she said. "Sure," I replied. She took my camera phone and I stood near the lamppost to have my picture taken. Cherry then recounted how a company of four humans have already entered Narnia before me to fulfill the prophecy, so she now wonders where I fit in because there's supposed to be only four, not five humans. She suspects I'm a hobbit. "But I have bad news," Cherry said bitterly. "I'm not supposed to divulge anything that will consitute a spoiler, so let me just tell you that a lot has happened already, and the White Witch has dealt a terrible blow to our heroes' company. They are now off to war. You better hurry if you want to see the excellent CGI to make the battle scenes." I nodded and asked if I can have some Turkish Delight first. "No! ", she exclaimed. "Turkish Delight is what turned things upside-down here in the first place. Besides, I think you need to cut down on your calories." I shrugged, and upon a wave of her ampalaya wand, a griffin appeared. I hopped on its back and set off to the battlefield. It was the strangest scene I have ever encountered. Ogres, Minotaurs, fiends, giants, wolves, on the side of the White Witch as she rode a sled pulled by polar bears. And on the side of the Sons of Adam and Daughters of Eve were fauns, noble centaurs, griffins, leopards, lions, even a rhino. It was a scene out of a fairy tale book and yet there they were, as real as the battle for Middle Earth. The White Witch (who looked so much like the Angel Gabriel in the movie Constantine, I wonder why ^_^) put on a stellar performance. I saw the battle end and stayed on in Narnia until Cair Paravel once again ruled all of Narnia. I had lots of fun staying there, from the time Lucy first discovered the wardrobe to the end. The end being the Cherry flavored ampalaya visited me in Cair Paravel and bitterly told me that I have to leave Narnia. Thanks Cherry for the premier! 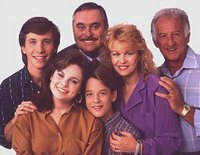 The Wonder Years starring Fred Savage. I liked the way stories are narrated in the eyes of a kid as he goes about life. Moonlighting starred Bruce Willis and Cybil Shepherd in a detective agency called Blue Moon Investigrations. A bit of sleuthing with a good love story mixed in. Must be my Hardy Boys / Nancy Drew Mysteries Days that got me liking detective shows. This and Murder, She Wrote by Angela Langsbury. Max Headroom is about a news agency whose reporter named Edison Carter gets an electronic version of himself stored into the computer system through programming genius Bryce Lynch when Network 23 - the broadcasting company where Carter works - was hiding a potentially dangerous program that makes people keep watching their channel but makes others explode or combust and was getting a bit too nosey. The electronic image of the unconscious Carter was supposed to contain all his memories and Network 23 can learn how much he knows but this image - who calls himself Max Headroom - evolved and took to hiding. 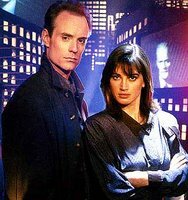 Carter, Max Headroom, and gorgeous reporter Theora Jones exposed the Network 23 management and continued to do zany deeds in succeeding episodes. Cool names, computer terminals with typewriter keyboards, and dark theme (literally; I don't think I've seen a scene there in broad daylight. It's always nighttime!) make this a favorite. Hmmm... I guess my fascination with computers evolved from watching too much TV. 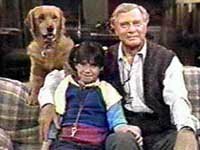 Punky Brewster stars Soleil Moon Frye. I remember her name because it's so unique. I thought her bed was cool. It was made from a straw cart. It's inclined when not in use and when she gets to bed (at the end of every show) the cart props up to a horizontal position. She was an orphan with a dog who gets adopted by a kind old man. Or am I confusing her with Annie? Hmmm. Let's do the dance of Joy! How about some pig snout! 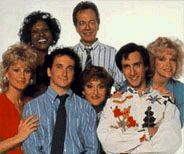 I've been watching the antics of Balki Bartocomus and Larry Appleton in Perfect Strangers but the wierd part is, I was not able to watch their two-part series finale. Wierd. Mr. Belvedere! The butler with an amazing sense of humor. 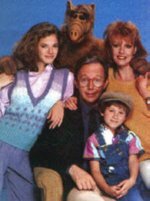 I loved watching this show. An English butler in an American home. Hear ye hear ye Generation Xers! 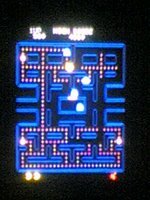 Re-live the glorious moments of classic arcade games PacMan, Galaga, and Galaxian in the Namco Museum 50th Anniversary Game for the PS2! Includes 14 arcade games we all grew up with, including those I mentioned above! After so many years, these games still haven't lost their touch. I played these three games last night and I was so absorbed into beating my score that I didn't realize it was already 2AM! I fed the sound into the mini-component and it was simply great. Especially the PacMan. 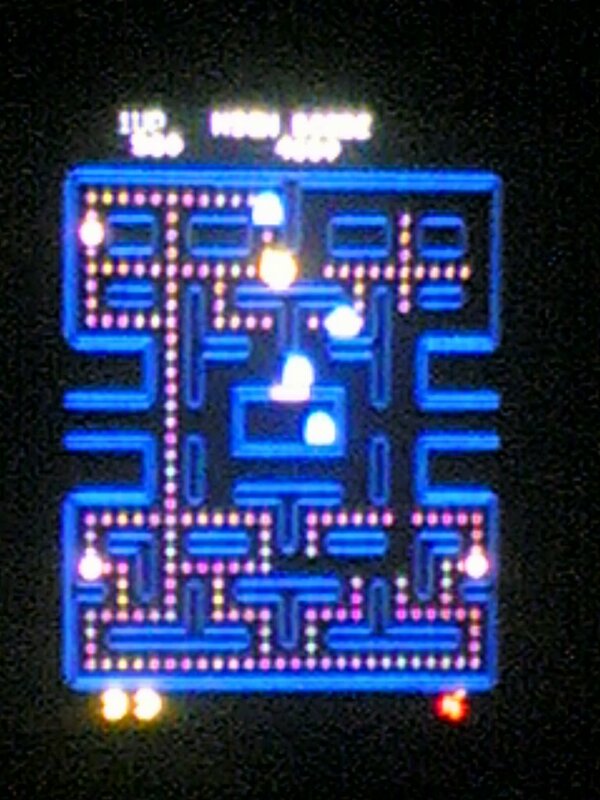 There's a Ms. PacMan too! It was like I was inside the FunHouse once more (not that I went there often). Ah yes, we are a video-game family. Even my mother was hooked into Battle City and Tetris. She and her sister would play til the early morning. 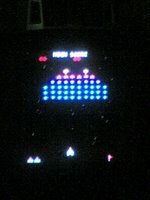 My brother loved going to the arcade, while I usually rented out Game and Watch or borrowed my Aunt's Mario's Cement Factory, Parachute, Egg, Octopus, and Fire. 1995? I was on my second year of being a taxpayer and I think I was still a Sales Engineer then, and being trained as a Systems Engineer. The year 2000: I resigned from work in February and found out 7 months later that I missed the friends and work I left behind so I went back in September. I also went to Hongkong for vacation (I would go abroad normally for work), and that was the last time I went abroad. My wife got pregnant with Jo-Lo! Our miracle baby, because she had a complicated pregnancy that got her in the hospital for a week in December. I also started blogging last year. 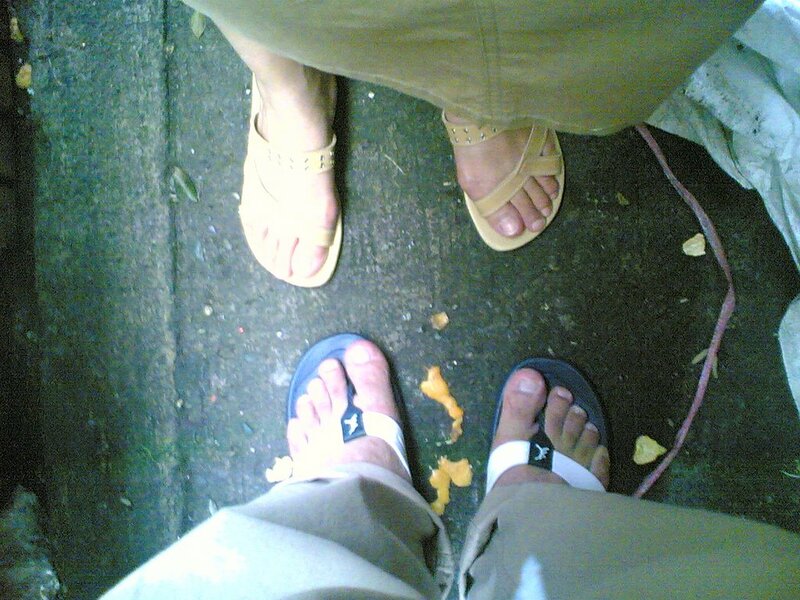 I was in Baguio with my wife and Jo-Lo. He was still being his rambunctious self when it was already 11PM so I decided to take a quick nap to stay with them. I woke up at 12:30AM and rushed off to the bus terminal bound for Manila. We plan to continue our Christmas rush for the company. Aaargh. I'm blogging. Just got back from Christmas rush for the company. I arrived from Baguio at around 6 this morning so I still feel sleepy. Last weekend was quite a busy one for me. First off, we had our three-day business planning that lasted til Saturday morning. Then my wife arrived later in the night because she was godmother to her friend's daughter. Morning found us taking a couple of jeepney rides to Paco, constantly asking (or is it nagging?) the driver if we were near Herran and Concordia yet. We made it in good time, actually, considering how inept I can be at giving and following directions. Which is why I didn't bring Blackie along. I can get so hot tempered when I get lost while driving. I observed new things during the ceremony. Firstly, theirs is more elaborate than the one Jo-Lo had. The godparents actively participated in blessing the child and professing the faith in behalf of the kid as they held candles. 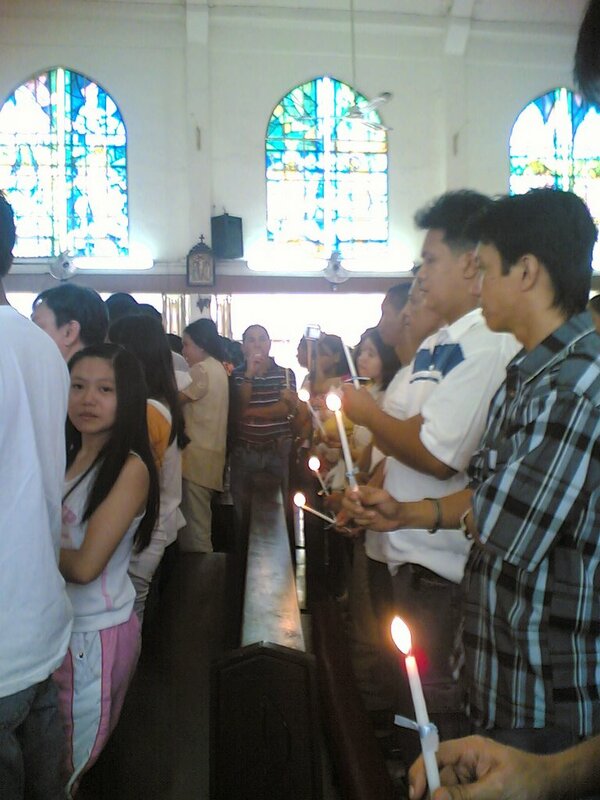 Which made me wonder about the inconsistency in the ceremony here and in Our Lady of Lourdes Church in Baguio. Are the priests allowed to make these changes? I would have appreciated having this ceremony for Jo-Lo, and I'm sure the godparents would have too, inspite of its being more lengthy. At any rate, despite warnings by the commentator, most parents rushed off in leaving the church after the christening. It's believed that the kid who goes out first will dominate the other kids in his christening batch. Funny thing is, after rushing out, they went right back in to have their group photos taken. I also learned some new things during the christening. A kid will go through three sacraments: first is Baptism which is done as soon as possible, then Confirmation when he reaches the age of 12, then Communion afterwards. Godparents must be 16 years and older. At this age, it is believed that the person is now able to make sound judgements and is able to comprehend the responsibilities accorded him or her as a godparent. Of course, that is subject to debate :-). At the altar, a group of boys started rehearsing their roles as sacristans. Reminded me of the time I did some chapel service way back in high school. After the christening, we went to their home and had our hefty lunch. After some time, the father was making his rounds among the guests and was asking, "hard o beer?" It's drinking time! Ummm ... I really do not drink that much inspite of what Cherry says. And even for beer, I only drink San Mig Light. So I said beer and was promptly given a Pale Pilsen. Uh oh. I motioned Tina to ask for San Mig Light. So she was given one as well. Wait a minute ... now I have to drink two beers! Tina tried taking a gulp or two, and she grimaced every time. 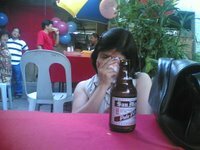 I drank most of it and half of the Pale Pilsen, then we bade farewell and set-off to Divisoria! 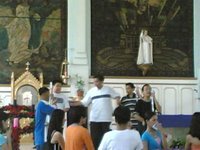 As godparents, we remember our inaanaks on Christmas by giving them gifts. But that list is getting longer every year so our shopping time gets longer too. Not that we're complaining; we also get to do shopping for ourselves and friends and family anyways! 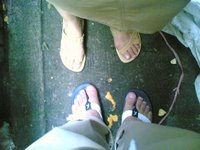 After our footwear change (which we also bought in Divi), we spent the rest of the afternoon milling about, haggling, and hauling our purchases around.